Well there's a first time for everything. Walking up the steep stairs at Revolver (taking care to not touch the sticky handrail, of course) while sober was a surreal, novel experience. It was worth the effort though, given the grungy-but-great diner hidden at the back of the iconic nightclub/live music venue. 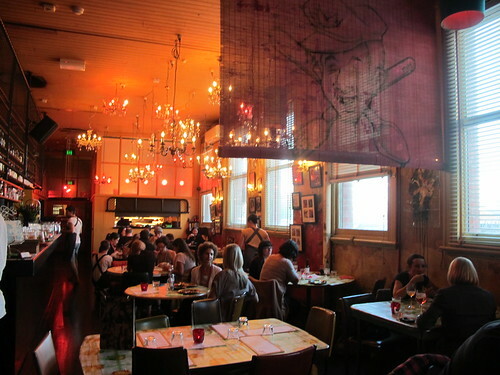 Children are welcome in the restaurant during opening hours: a family-friendly Revs, imagine! Colonel Tan's is chef Karen Batson's Prahran offshoot of her Thai city hotspots Cookie and Choo Choo's (the late-night diner at Toff in Town), both in Curtain House on Swanston Street. At Colonel Tan's, the floral tablecloths are plastic and the drinks menu is extensive. And the food? It's cheap and very, very good. The menu is mostly authentic Thai, plus a few random curve balls (eg rendang with roti, club steak sandwich with fries, tofu 'whopper' burger with peanut sauce). 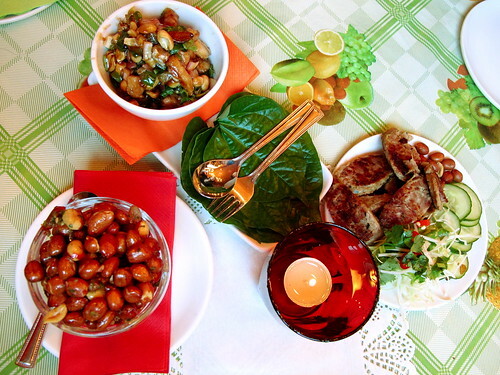 When I visited with some girlfriends the other week, we started with chilli peanuts ($3.50), snapper, peanuts, ginger, chilli and lime wrapped in betel leaves ($10.50), and grilled Thai sausage and cucumber with cabbage and ginger ($11.50). 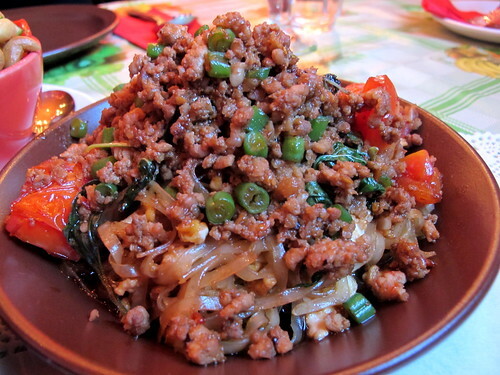 I particularly liked the Thai sausage, which was slightly crumbly without being dry. 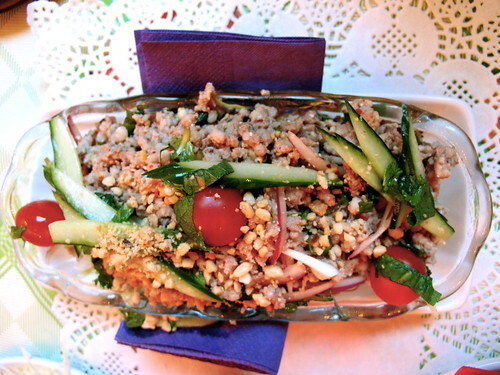 Next was a bloody nice larb: a salad of minced pork, peanuts, tomato, cucumber, kaffir lime and chilli ($14.50). The other porky dish we ordered was the dubiously-titled-but-delicious 'Bangkok bolognaise' ($15.50), served with rice noodles, Thai basil and plenty of jungle heat from both chilli and green peppercorns. It's something of a signature dish, and I'm very glad Jack insisted that we order it. Also enjoyed: potato, pumpkin and peas in red curry ($14.50) and the fat duck noodles ($16.50), a smoky and - relatively - mild antidote to the Bangkok bolognese noodles. Oh, and to finish? A basket of the Colonel's five spice fried chicken served with sweet chilli ($16.50). Colonel Tan, not Sanders, and a damned sight better than anything you'd get down at KFC. 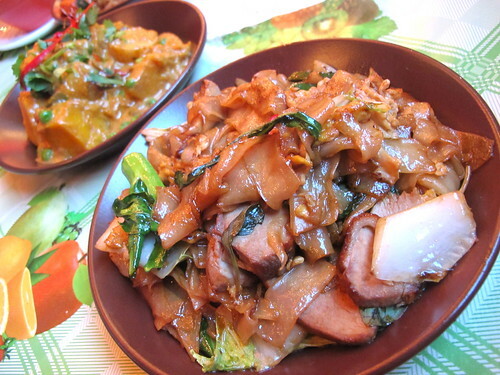 I know I often whinge on the blog about how average most Thai food in Melbourne is compared to what you can get in Sydney, but if Colonel Tan's was just around the corner from where I lived you wouldn't hear any complaints from me. 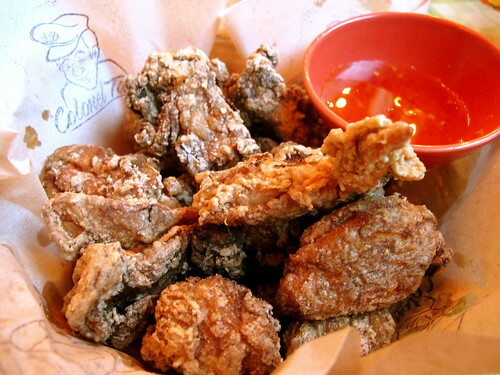 For those that DO live or work in Prahran, every Thursday night at Colonel Tan's is Locals Night: if you can prove that you live or work in the 3181, you get 50% off your food bill. My friends and I do trivia at Revolver on Tuesdays, which is held in the same space as Colonel Tan's, so I've had quite a bit of the menu by now! My favourite is probably the mushroom and tofu spring rolls, they're chock-full of juicy mushrooms and are deliciously comforting. Hey Claire, Fenn mentioned you were looking for silicone cupcake moulds? Here's a link: http://inplaceonline.com.au/kitchen-accessories/ramekins-cupcake-moulds/ciroa-set-of-12-large-silicone-cupcake-moulds/? In exchange, can you recommend anywhere that sells silicone icypole moulds? I can't find them ANYWHERE.